A dash of kindness, a spoonful of laughter and a heap of love brings joy ever after! 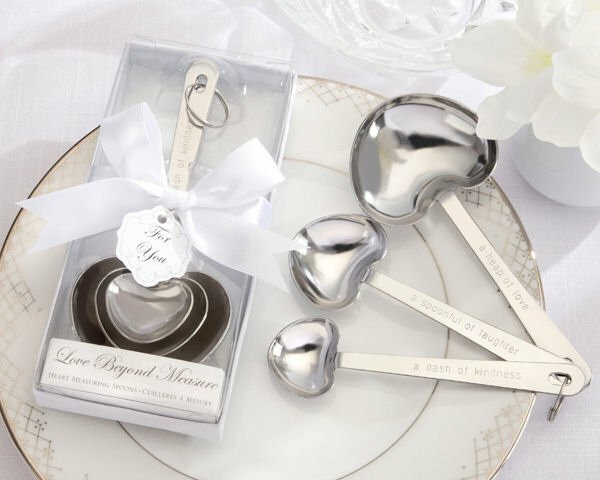 Our 'Loving Spoonful' Heart-Shaped Measuring Spoons are tasteful and attractive as a wedding favor or gift for the cook in your life. Three heart-shaped measuring spoons crafted from stainless steel and feature "measures of love" on one side with traditional measurements on the other. Biggest spoon measures 5" x 2 1/2"
Presented in a white box with a white satin ribbon and bow and matching "For You" gift tag. Gift box measures 5 3/4" x 2 1/2" x 1/2". If I order 100 of these, when will they arrive? These are not available until December 20th. It depends on where they're shipping to (ship from Atlanta), but it's generally 10 business days for delivery from the date of purchase.